This entry was posted in featured, News, Product spotlight on July 6, 2016 by Katharine Allenby. 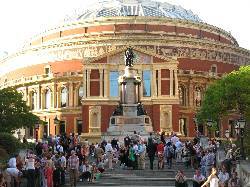 One of the huge privileges of being part of the BBC Symphony Chorus is taking part in the Last Night of the Proms at the Royal Albert Hall. We are the amateur choir attached to the BBC Symphony Orchestra, and our ranks are made up of people from all walks of life, such as teachers, lawyers, students, doctors, HR people, photographers, care workers, tax specialists, psychologists, fund raisers, arts administrators, mums, and even a couple of publishers. In some ways we are a disparate group, but we are united by our love of singing, taking on challenging music, and performing it to the highest standard. For us, the Last Night of the Proms is a bit like an end-of-term party, after the hard work of the whole Proms season. It is certainly different from many of the concerts we do with unusual repertoire and smaller audiences. We usually perform in five or six concerts over the eight-week Proms season, but often start rehearsals for them in the January or February previously, in order to have enough time to prepare the demanding works we are asked to sing by the orchestra. For the Last Night we cast aside our usual black concert wear and bring out the party dresses and the bling, and this year a Sikh member of the tenors treated us to a red, white and blue turban. This entry was posted in Guest article on September 28, 2012 by Katharine Allenby.